CMP’s Medical Pass Through Window Assembly’s facilitate movement of items between the hospital decontamination area, prep/packaging, and sterilization, sterile processing department (SPD), Central Sterile Supply Department (CSSD) or hospital pharmacy. CMP Hospital Pass Through Windows provide a vital component of the SPD decontamination area, along with CMP Processing sinks, and CMP Instrument Pegboards. 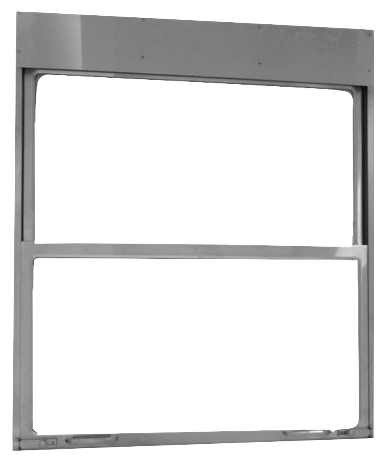 Stainless Steel Pass-through Window Assembly help maintain negative air pressure in soiled utility, protecting the clean areas. They are available in many standard sizes and can be customized to meet any requirements. Double hung window with counter balanced sash, constructed with removable stainless steel frame and ¼” thick tempered safety glass window pane. Double pan rack return doors are mounted with spring loaded hinges for self-closing. Latches lock the window in place. Pass thru windows are available with optional set down counter shelf, hinged glass doors or solid doors. The Pass-Through Window assembly shall be constructed entirely of type 304 stainless steel polished to a no. 4 finish. 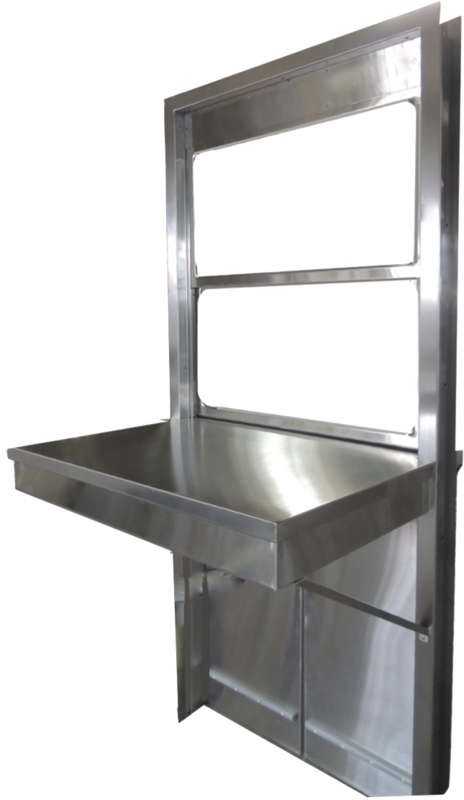 The Pass-Through Window assembly shall facilitate movement of items between the decontamination area and prep/packaging and sterilization areas. The wall frame shall be constructed of number 16 gauge stainless steel with welded corners, ground and polished smooth. The frame shall be telescoping for easy installation into wall. The depth of the pass-through window assembly frame is determined by the wall thickness. 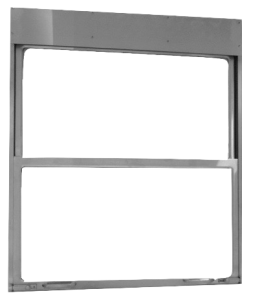 Pass Thru Window’s optional shelf or set down counter is constructed on number 16 gauge stainless steel with 1-½” high boxed edge and cantilever wall support brackets on each end. Underside of the counter is reinforced with channel stiffeners. The top is 38” wide x 31-½” deep and shall be mounted 42” above the finished floor. Dimensions listed are for Model PTW-3884. Custom depths available. Double hung window Pass-Thru window with counter balanced sash, constructed with removable stainless steel frame and ¼” thick tempered safety glass window pane. Clear opening is 32” wide x 16” high. Dimensions listed are for Models PTW-3884 and PTW-3844. 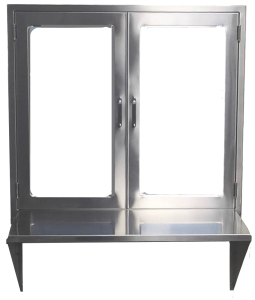 The optional solid rack return doors are constructed of number 18 gauge stainless steel, double pan doors mounted with spring loaded hinges for self-closing. Clear opening is 34” wide x 37” high. Dimensions listed are for Model PTW-3884. 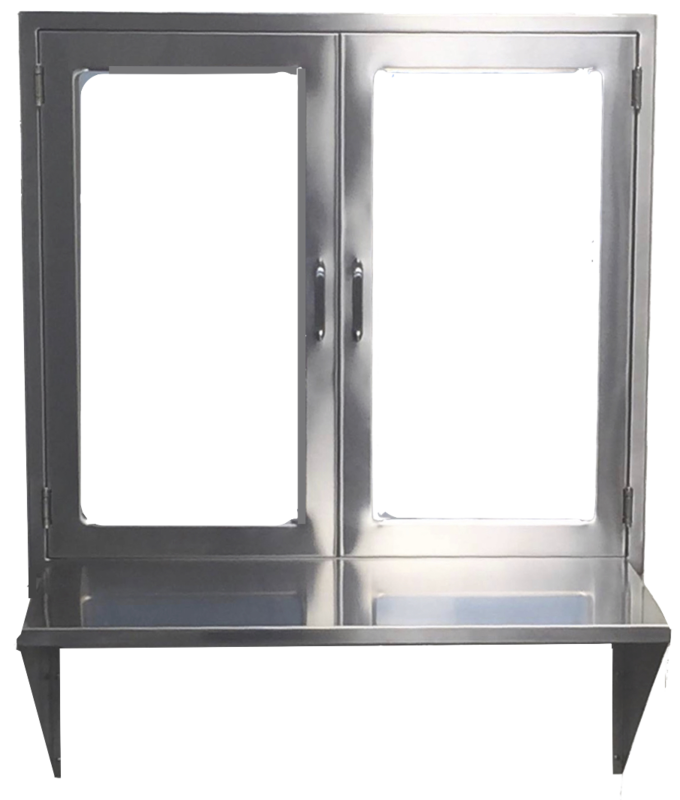 Model PTW Pass Through Windows shall be constructed of Type 304 stainless steel, welded by Heliarc process, with exposed welds ground and polished to No. 4 finish. 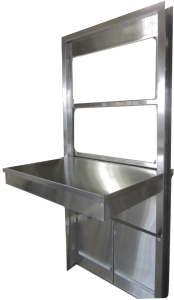 All Models can be ordered with a set down counter or stainless steel shelf on one side or both sides. All Models can be ordered with Hands-Free Automatic sensors for opening and closing.